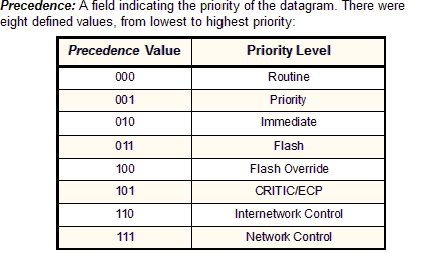 This one-byte field was originally intended to provide certain quality of service features for IP datagram delivery. It allowed IP datagrams to be tagged with information indicating not only their precedence, but the preferred manner in which they should be delivered. It was divided into a number of subfields, as shown in Table 57 (and Figure 86). The lack of quality of service features has been considered a weakness of IP for a long time. But as we can see in Table 57, these features were built into IP from the start. What's going on here? The answer is that even though this field was defined in the standard back in the early 1980s, it was not widely used by hardware and software. For years, it was just passed around with all zeroes in the bits and mostly ignored. Delay: Set to 0 to request normal delay in delivery; set to 1 if low delay delivery is requested. Throughput: Set to 0 to request normal delivery throughput; set to 1 if higher throughput delivery is requested. Reliability: Set to 0 to request normal reliability in delivery; set to 1 if higher reliability delivery is requested. The IETF, seeing the field unused, attempted to revive its use. In 1998, RFC 2474 redefines the first six bits of the TOS field to support a technique called Differentiated Services (DS). Under DS, the values in the TOS field are called codepoints and are associated with different service levels. This starts to get rather complicated, so refer to RFC 2474 if you want all the details. Understanding the IP datagram format is an important part of troubleshooting IP networks. Be sure to see the following topic on options for more information on how IP options are used in datagrams, and the topic on fragmenting for some more context on the use of fragmentation-related fields such as Identification, Fragment Offset, and More Fragments.